This post by Victoria Molina  was originally published on Ensia.com , a magazine that highlights international environmental solutions in action, and is republished here as part of a content-sharing agreement. A few days after her death, Nelson García, another leader of the Council of Popular and Indigenous Organizations of Honduras (known as COPINH), which Cáceres founded in 1993 to advocate for the native Lenca peoples’ rights, was also murdered. “Berta had such an amazing support network and she had done so much great work in reaching out to other organizations both domestically and internationally that there’s this enormous outrage when she was assassinated,” says Danielle DeLuca, project manager for the US-based nonprofit Cultural Survival, which advocates for indigenous groups around the world. Honduras has one of the highest homicide rates in the world, and it is notoriously unsafe for environmental activists. According to the not-for-profit justice organization Global Witness , at least 109 people were killed in the country between 2010 and 2015 for taking stands against dams, mining, logging or agricultural projects. Scholars and activists blame a combination of organized crime and a deficient judicial system that has led to corruption — all born of a history of poverty, inequality, political instability and the protection of corporate interests over indigenous rights. Rosana Resende, a cultural anthropologist at the University of Florida, says the economic culture of entrepreneurialism and lack of restrictions that gained momentum in Latin America in the 1980s set the framework for increased privatization of global resources. Also during the 1980s, much of Latin America was crippled by a debt crisis. The International Monetary Fund and other institutions implemented a number of policies, known as the Washington Consensus , to reform the region’s economy. These policies privatized government industries, opening them up to foreign direct investment and liberalizing trade. Transnational companies entered indigenous territories historically cared for by local people to extract resources. “It was the privatizing and foreign direct investment pieces that really led these countries to becoming vulnerable to large extractive corporations,” Resende says. Since 2009, DeLuca says, Honduras and the United States increased the call for investment into the country in response to high poverty levels. But the investment and job creation has been a double-edged sword: “Along with that investment comes often a disrespect from corporate entities for human rights and indigenous people’s rights,” she says. The Lenca began opposing the Agua Zarca Dam project in 2006; the Gualcarque is sacred to them, and they are concerned about the dam’s environmental impact on the river and its life. Cáceres organized peaceful protests to voice the community’s discontent. She helped push the largest dam builder in the world, China’s Sinohydro, to withdraw from the project. In 2015 she was awarded the Goldman Environmental Prize  in recognition of her activism. Death threats against her increased. On March 3 of this year, her killers made good on them. This time, though, the violence has brought unprecedented backlash. Less than two weeks after Cáceres was killed, the Dutch development bank FMO suspended all activities in Honduras. Finnfund, a Finnish development finance company, suspended its payments to the Agua Zarca project a few days later. FMO also is sending a fact-finding mission to Honduras that will include the bank’s CEO and energy sector director, says senior press officer Paul Hartogsveld. The mission will also include a delegation of independent experts to determine and validate the procedures that have been applied to Agua Zarca. “After that we will make a final decision on the project and our suspension of Honduras,” Hartogsveld says. The violence also has strengthened the resolve of the Lenca indigenous community to fight the Agua Zarca dam and other development projects Berta Cáceres opposed. Cesario Padilla, a journalist and activist in Honduras, says while the climate of terror within these communities now feels permanent, at the same time there is a strong willingness to continue the struggle for indigenous rights to co-exist with natural resources. For example, leaders of COPINH met with the vice-minister of the Honduran Ministry of Energy, Natural Resources, Environment and Mining two weeks after Cáceres’ murder to request that the ministry cancel the permit for the Agua Zarca dam. Members of COPINH have also been protesting outside the Public Ministry in the Honduran capital, Tegucigalpa. And, in an initiative they titled “Justice for Berta Cáceres,” they called on Hondurans abroad and other sympathizers to protest peacefully outside Honduran embassies in their countries on June 15  to demand transparency on the murder investigation and a cancellation on the Agua Zarca dam. According to Tomás Gomez, the current coordinator of COPINH, the military presence near the area where the Agua Zarca dam is being built has increased and members of COPINH continue to be intimidated and threatened. But there are also indications that the Honduran government is finally heeding calls to ferret out corruption. After global pleas for action, four suspects — two of them associated with Desarrollos Energéticos S.A., the local private energy company building Agua Zarca — were detained in Honduras in early May in connection with Cáceres’ murder. 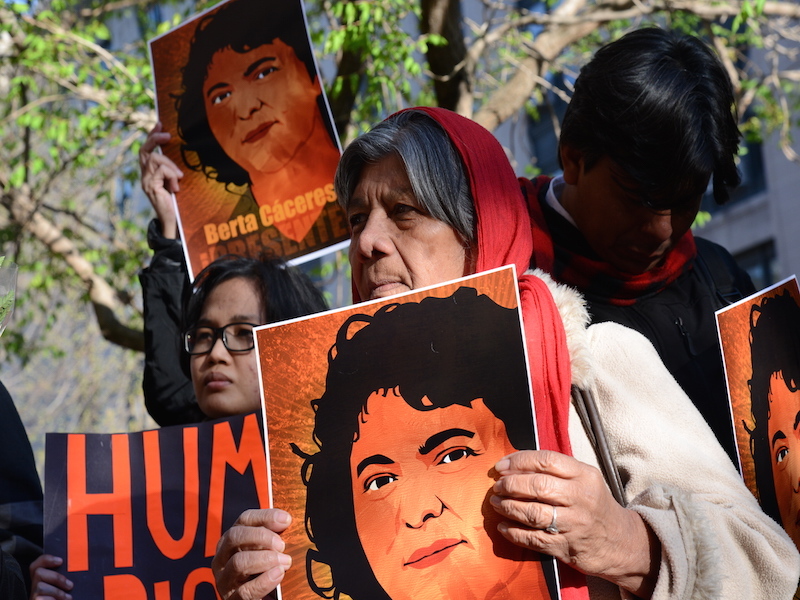 But Padilla says the Honduran government still shows reluctance in taking action on two of the Cáceres family’s main demands: to allow them and their team of lawyers to be a part of the investigation into Berta Caceres’ murder and to allow an independent investigation led by the Inter-American Commission on Human Rights. Environmental and human-rights activists fear continued killings, threats and persecution. Padilla and DeLuca say the Honduran government needs to do more — in terms of protection for Berta Cáceres’ family, other members of COPINH and Gustavo Castro, the only witness to Cáceres’ murders; getting to the bottom of the murders; and scrutinizing projects that threaten indigenous people and the environment. The Honduran Public Ministry, the government entity handling the Cáceres case, did not return numerous calls and emails requesting comment. DeLuca says the continued hostility toward COPINH after the murders is a clear sign the crisis won’t be solved without the help of other nations with a stake in the country. She calls on U.S. citizens in particular to urge the Department of State and Congress to put pressure on Honduras to accept an independent investigation. “We don’t have confidence in the state of Honduras to conduct an independent investigation,” DeLuca says. Ultimately, activists hope to change the nature of development in Honduras to give local communities a voice when their interests conflict with those of international development corporations. As part of that, Cáceres’s daughter, Laura Zuñiga Cáceres, is calling on other countries to consider human rights in their investment decisions. “It is also important that the international community reflect about the role played by their own governments in Honduras,” she says. Resende says it remains to be seen whether Cáceres’ murder is a sufficient catalyst to effect policy that is centered on the people. “Little change is possible, but we are also currently experiencing a moment in time when activism is gaining momentum,” she says. Victoria Molina  is a journalism student at the University of Florida whose research focuses on inter-ethnic relations in Eastern Europe, immigration and neoliberalism in developing countries. Her writing and radio broadcasts have appeared in WUFT News and WUFT Noticias, the NPR affiliate news platforms at the University of Florida. She tweets from @vmsugranes . She produced this feature as a participant in the Ensia Mentor Program . Her mentor for the project was Cynthia Barnett. Some of the quotes in this piece were translated from Spanish. The piece also appears in Spanish at LatinAmericanScience.org .